Hungarian Foreign Minister Meets Trump Aides, Including Sebastian Gorka, in Washington D.C. According to Hungarian wire service MTI, Hungarian Foreign Minister Péter Szijjártó met several members of US President Donald Trump’s White House Staff in Washington D.C. on Tuesday. These included Jason Greenblatt, Trump’s former lawyer and the incumbent of the newly-created position of United States Special Representative for International Negotiations, as well as Hungarian-American Sebastian Gorka, Deputy Assistant to the President for national security affairs. Gorka, a national security expert who has served as a Fox News contributor and national security editor for far-right news site Breitbart, has been in news lately over a controversy surrounding his father’s membership in the Order of Vitéz (Vitézi Rend). This has led to some news outlets accusing Gorka of somehow having ‘Nazi’ affiliations (read our in-depth article on the “controversy” here). He was also charged with a weapons offense last year for attempting to bring a gun onto an airplane, a charge which has since been dismissed. Born in London to parents who had fled the Hungarian Revolution of 1956, Mr. Gorka has in the past served as an advisor to Hungarian Prime Minister Viktor Orbán. He also worked at the Hungarian Ministry of Defense during the Prime Ministry of József Antall, Hungary’s first PM following the end of Communism. 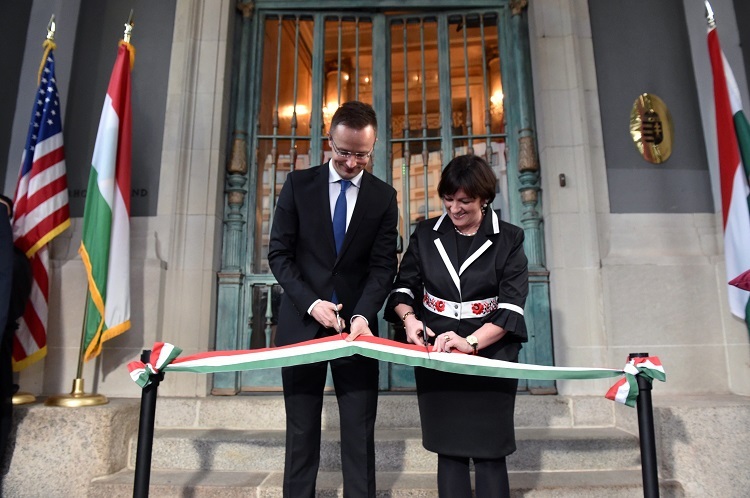 In addition to meeting Gorka and Greeblatt, the Hungarian Foreign Minister officially opened Hungary’s new embassy building in Washington D.C. Following a greeting by Hungarian Ambassador to the United States Réka Szemerkényi, Szijjártó expressed his hope that the inauguration of the new embassy building would mark the start of a better relationship between Hungary and the United States. Speaking after Ambassador Reka Szemerkényi’s opening address, Szijjártó expressed hope that the opening of the new building would mark the start of new initiatives resulting in a “common success story” with the United States. The Foreign Minister claimed that, since Donald Trump’s election, America is pursuing “more patriotic” policies. He also expressed the Hungarian government’s view that Trump’s presidency will “be successful in making America safer and greater,” which, he claimed, would make the world a safer and greater place. Szijjártó claimed the world is now facing a discernable fresh start a “fresh start”. He expressed his belief that what he termed the “age of hypocrisy and political correctness” has come to an end. 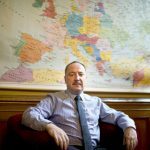 He argued that the previous US Administration’s “intrusion into Hungary’s internal affairs” has also ended, and that “America’s new approach to Hungary is much more constructive. Szijjártó added that the fight against ISIS, and against terrorism in general, remains the greatest threat currently facing the civilized world. He called for a redoubling of efforts to defeat the Islamic State, and expressed Hungary’s pride in being one of 27 countries fighting alongside the United States in this effort. Later in the day, Szijjártó spoke at a business dinner held by the American-Hungarian Chamber of Commerce, where he praised the effects on world economics of supposed “changes in American economic policy.” Attendees at the event included representatives of Lockheed Martin, Fedex, Comcast, Citibank and Procter and Gamble. The next day, Wednesday, Szijjártó addressed a meeting of the foreign ministers of the countries that are part of the global coalition fighting ISIS and terrorism.